Protect your cars upholstery from scratches and damaging marks with the Alphabetz Kids Car Seat Protector and Undreamt with Storage Pockets. The easy-to-clean and durable undreamt work perfectly with both forward-facing and rear-facing car seats. Anti-Slip Material Secures the car seat in place, and also keeps the child's car seat safe during movement, preventing it from shifting from its place. There is a convenient storage pocket for you to store essential items handy. Protects Your Car Seats from Scratches, Dirt, Liquids, and Other Damaging Marks. ANTI-SLIP Traction Technology Protects the Car Seat From Shifting or Slipping From its Place. 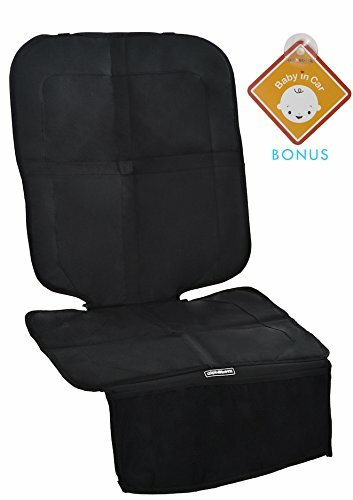 DEAL 2-WAY USE: Because The Front Panel Bends Downwards, This Car Seat Protector is Ideal for Both Forward-Facing and Rear-Facing Car Seats.